Every cuppa has a story. For Irvine Quek, what seems like an innocent job offer some years ago blossomed into something that altered his view towards coffee and the craft behind it. At the tender age of 20, Irvine has had his fair share of trials and tribulations to be where he is today when he emerged as 2018’s champion for the annual Malaysia Latte Art Competition. This week’s featured interview with Irvine has further reinforced the fact that each and every one of us will be give a fair amount of opportunities in life, but the outcome lies on how much you appreciate each opportunity that was given, and how much sacrifices you’re willing to make to harness your skills to bring you where you want to be. Enjoy! 1. Hi Irvine! Share more about yourself to our readers! Hello! I’m Irvine, a professional barista at 103 coffee workshop. I’ve been working as a barista for 3 years now, and I am the current Malaysia Latte Art Champion (2018). In the past, I’ve also competed in many other national and international competition which were held in other countries, such as Thailand. This is to keep my momentum going and also to get myself ready for my national championship. Just to name a few personal achievements, I am the two-time champion for FLC Free Pour Latte Art Championship in 2017, champion for Battlefield of Best Pour Latte Artist, champion for R8 World Latte Art Battle, and more. With my recent win at the Malaysia Latte Art Competition, I’ll be representing Malaysia in the world stage in Brazil this coming November. 2. What inspires you to be a barista, and how you started this journey? Actually, I’ve never thought of being a barista. Back in August 2014, I was just an ordinary 16 years old teenager who wanted a part time job to earn some money to get a new phone. My current boss (Mr Ken) gave me a call and asked me whether I need a job, and I said yes. That’s where my journey as a barista began. 3. Are you a coffeeholic? Initially I wasn’t a coffeeholic, but after taking my job as a barista, I have to do coffee calibration at least trice a day. So that’s where it started. During my off days, I will still have at least 2-3 cups of coffee per day because it has became a habit of mine. I will also visit different cafes to explore and taste different coffee to improve my sensory skills. 4. Share with us your most memorable competition experience. It has got to be the R8 World Latte Art Battle which was held in Chiang Mai back in December 2017. It was my 1st time participating in an international level competition where the contestants has to battle with all the best barista from around the world. I am humbled by the experience when I walked away as the champion. After the competition, we have a workshop with 4 of the best latte artists in the world, which are Arnon from Thailand (current world champion), Umpaul (2017 world champion), as well as Elly and Dash from Korea. It was an eye opening experience as I received a lot of advises which are helpful for me to improve my skills for competitions to come. I’d say that that’s by far the best trip in my life to date! 5. What do you enjoy most about being a barista? I enjoy making good coffee and pretty latte art for customers. I am especially happy when my customers appreciates my work as it gave a a sense of satisfaction and fulfillment in what I do. Having a good cup of latte with great latte art is like a good looking person with great personality. You’ll love them a lot! 6. 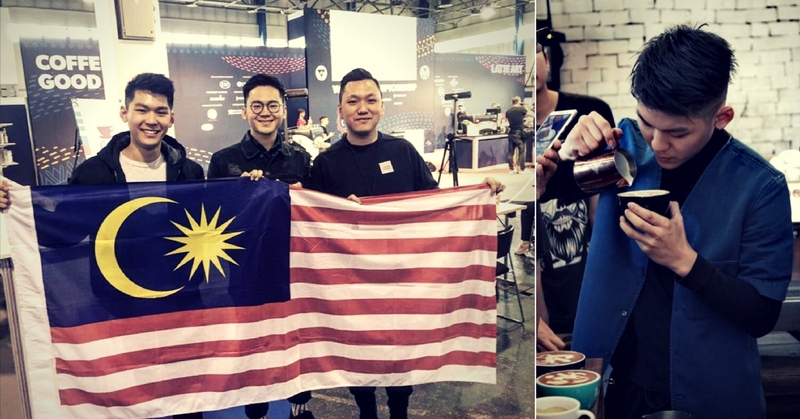 Share with us about your journey in the 2018 Malaysia Latte Art Championship. It definitely was a challenging yet exciting journey. Back in June 2017 where I just got back from the World Latte Art Competition which was held in Budapest, I found inspiration and the drive to improve as a latte artist at the highest level. I started to create and develop my patterns for National Championship. The start was not always easy; from drawing countless number of drafts, pouring hundreds of cups, I finally came up with my own pattern in October. I started practicing everyday to improve my pattern, ran through my routine and presentation right down to every single detail until January 25th, 2018. I stepped onto the stage and presented my hard work and passion. I was satisfied with my performances and I was overwhelmed the moment I was announced as the champion. Hard work is a two-way street- you get back exactly what you put in. 7. What are the most flattering comments you’ve received from customer about your latte art? “Nice latte art! Keep it up and I look forward to more different latte art patterns from you”. 8. Where do you usually seek for inspiration for new latte art designs? First, I’ll look for something that will make people happy. Something lovely. Most of them are animals, and I’ll try my best to make it look realistic in my latte art. I’ll make sure that everyone understand what I’m trying to present for every pattern I’ve created. 9. If you have to be one type of coffee for the rest of your life, what would it be, and why? I would like to be Kenya coffee. This is because Kenya has a very unique character which cannot be found in any other coffee. For first-time tasters, they will feel utterly impressed by the its characteristics, like grapes, blackcurrant, and wine-y. Long story short, I want to be a unique person where people will be impressed by my latte art. 10. Besides practicing latte art, what do you like to do during your free time? I love to draw during my free time to find new ideas for latte art patterns. Besides, I love listening to music, especially hip hop. I love eating desserts as well! 11. Who are your all-time inspiration? Arnon from Ristr8to Coffee, Chiang Mai, and Lucas from JWC Malaysia. The former is 2017 world champion and is a very experienced latte artist, whereas the latter is Malaysia’s 3 times national champion. I am really inspired and impressed by their skills, their way of thinking as well as their view towards competition and coffee. 12. How does a typical weekend look like for you? For me, it’s just a normal working day. Due to the massive flow of crowd, I am able to make more cups of coffee and make 103 and Malaysia proud. 13. Where do you see yourself in 2 years’ time? To be a very good trainer in my company, and set the bar high for latte art at 103. 14. Any advices you can offer for aspiring baristas out there? Keep going, never give up. Follow Irvine on Instagram for more of his intriguing latte art designs!